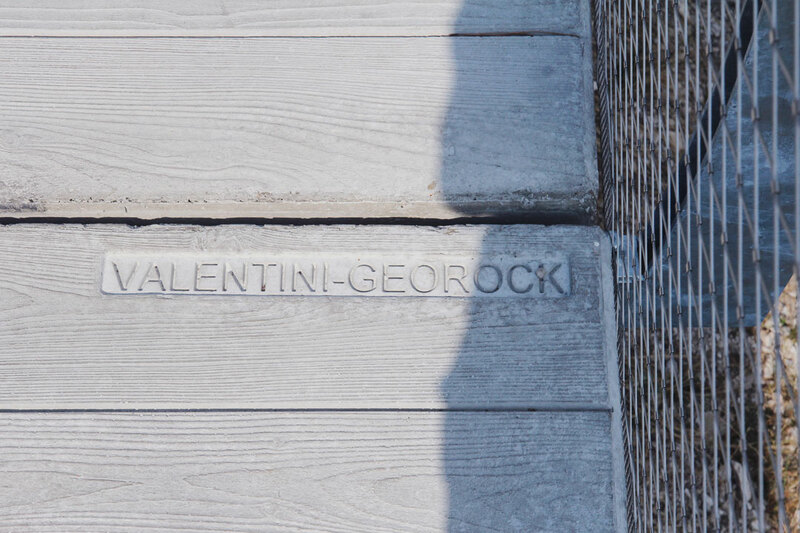 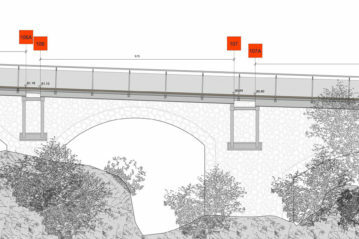 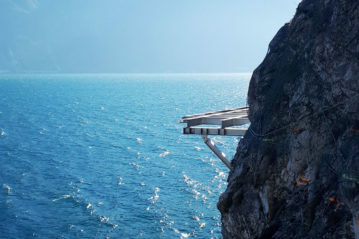 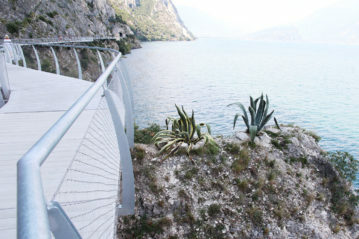 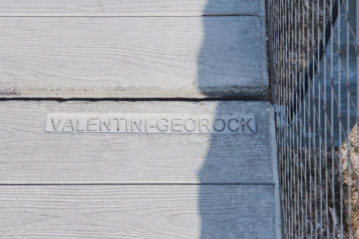 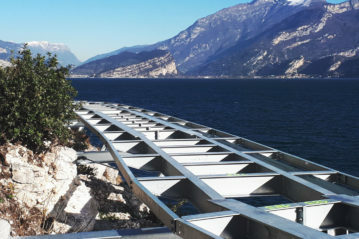 This is the most evocative stretch of the future Garda ring, just inaugurated, which from the town of Limone reaches the border with Trentino alongside the old Western Gardesana Road: with the particularity that, where the road enters the tunnel, the cycle/pedestrian path clings to the rock protruding on the waters of the lake. You can reach Limone through the lake, on the old wheeled boat built in 1908, where it seems to be in a novel by Agatha Christie. 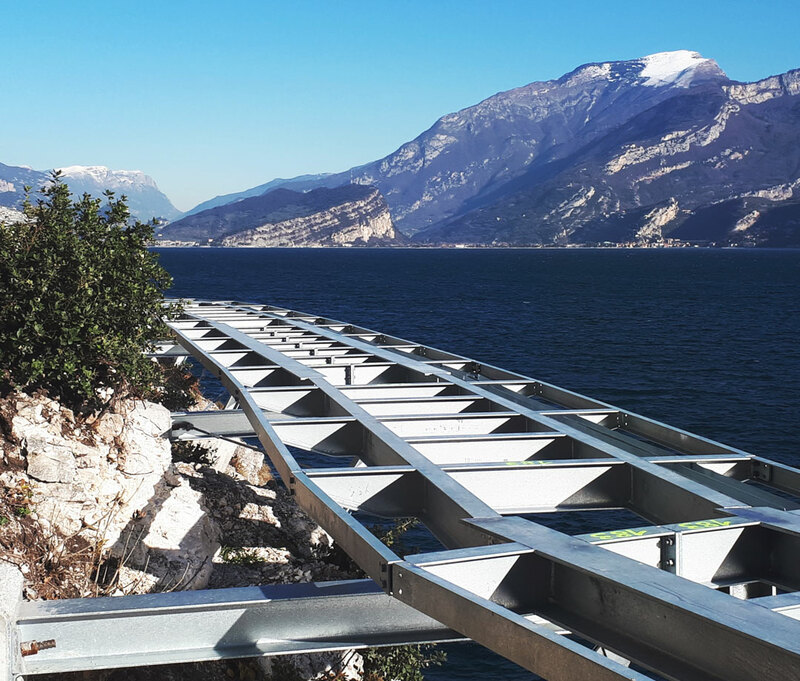 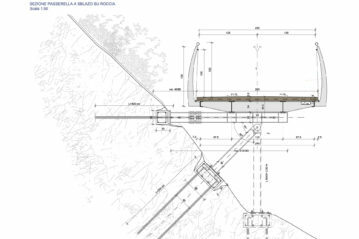 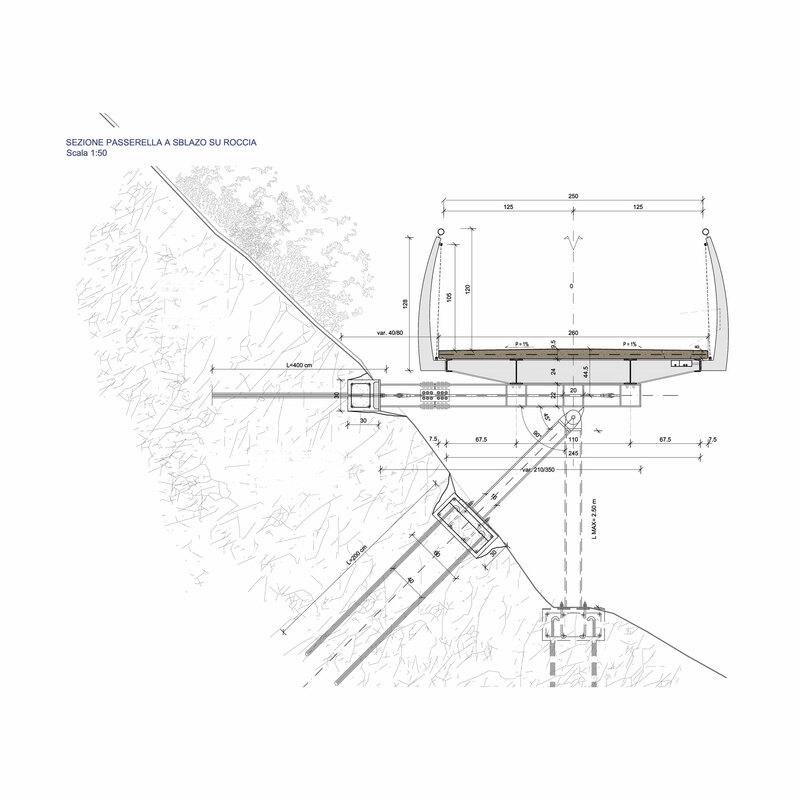 If you take it from Riva del Garda, you will skirt the stretch of the Gardesana that was affected by the project discussed in these pages. 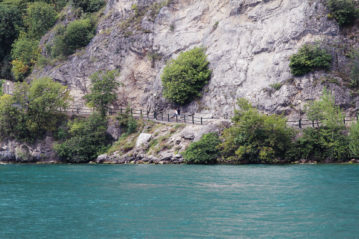 And from the lake you have a first approach with the “footbridge”, a thin line that cuts through the gray cliff in the stretches where it falls sheer to the water, while it is concealed by the trace of the old state road where the one remains “hooked” to the wall of this one. 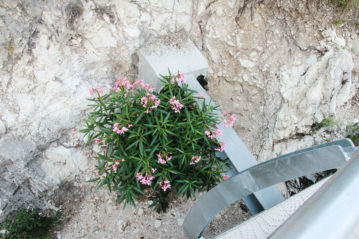 Tufts of Mediterranean vegetation appear at times when the rock recedes slightly, and the footbridge touches them or crosses them lightly. Then the landscape is monopolized by the remains of the great lemon houses, and, approaching the pier of Limone, by the hotels climbing on the side, which sometimes simulate, in a grotesque way, the construction rhythms of those. 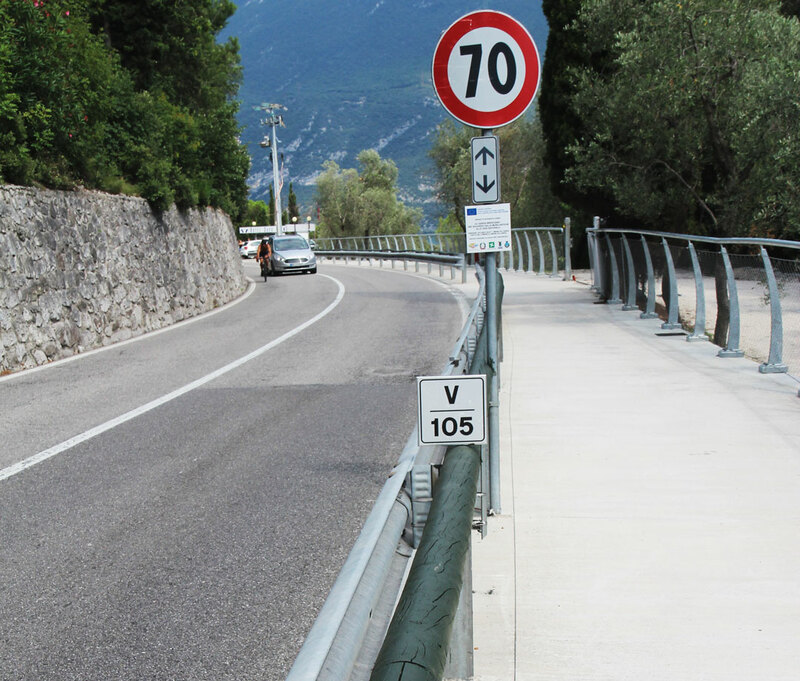 To reach, from the centre of Limone, the most engineering (and spectacular) part of the Garda cycle/pedestrian track, a taxi service is offered that allows you to effortlessly overcome the difference in height of about 40 metres from the level of the lake. 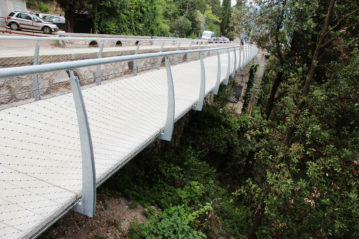 But it is a solution for “voyeuristic” tourism attracted by the campaign that was activated on the occasion of the inauguration of the work, which took place last July. 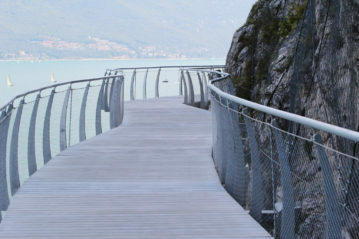 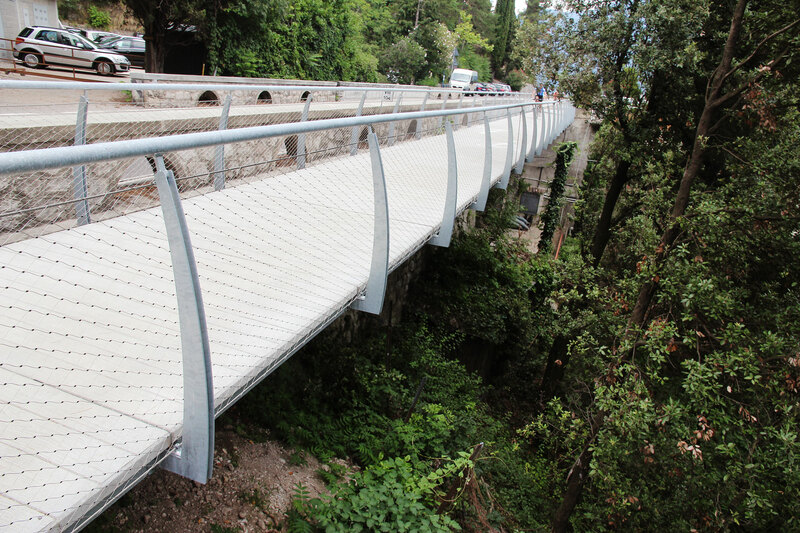 Instead, it is more appropriate than ever to take the Via Nova and walk (or bike) the two kilometers uphill that go up the slope through the old walls of the lemon houses, with sudden views of the lake, a path that is worth the trip even before arriving at the footbridge. And finally here are the two new kilometers, which offer a truly new experience, since along the old state road, which is next to us, you could certainly not stop to look at the view. 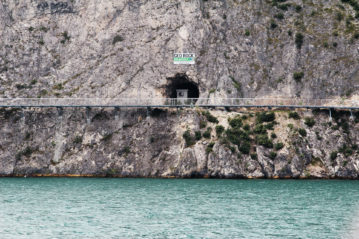 And where the asphalt road enters the tunnel, it was decided – instead of widening the tunnel in the rock – to hook on to the rock itself, bypassing the obstacle. 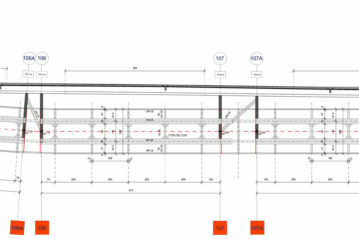 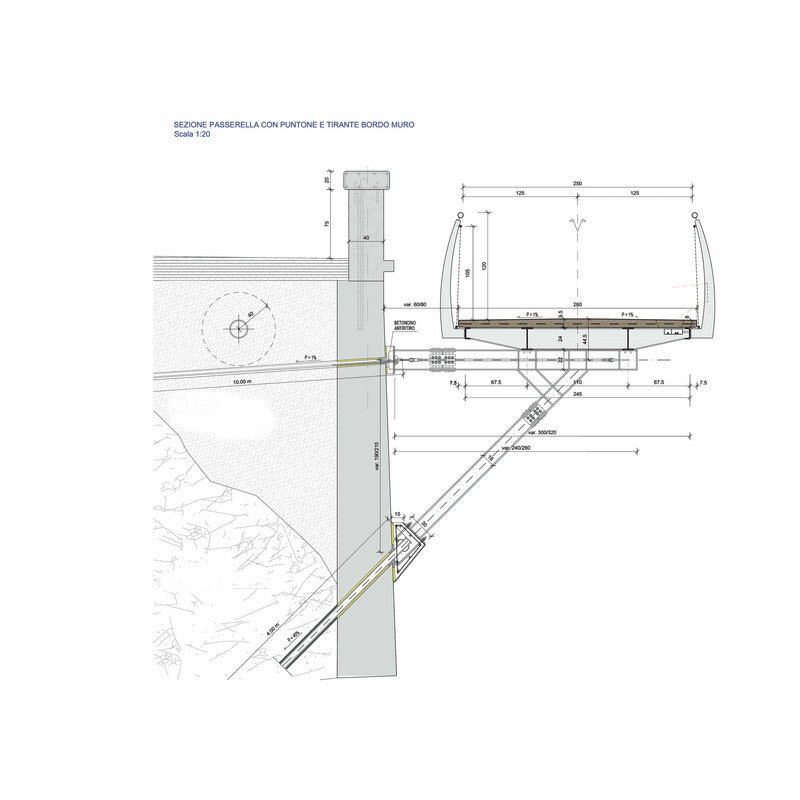 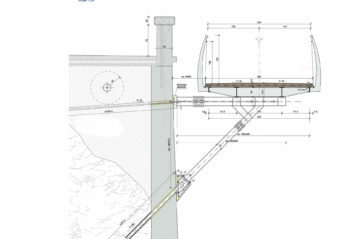 In these pages, the technical description is entrusted to the designers. 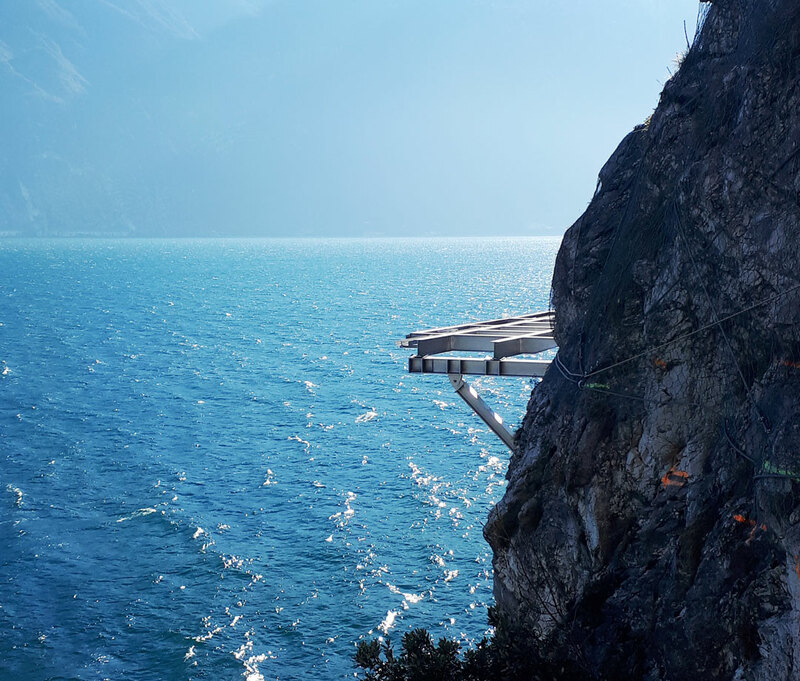 Here we can only be caught between the fascination of the experience offered to us (suspended on the side of the rock, with the lake below us and the sky above) and the fear of having in some way, albeit with the utmost caution, affected the integrity of an ancient landscape. Albano Marcarini, with his experience as an urban planner, landscape architect and above all as a low speed traveller, realizes this in another space between these pages. 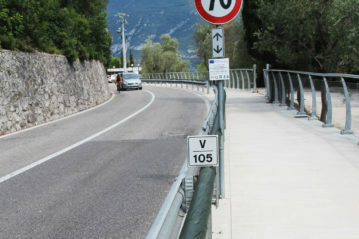 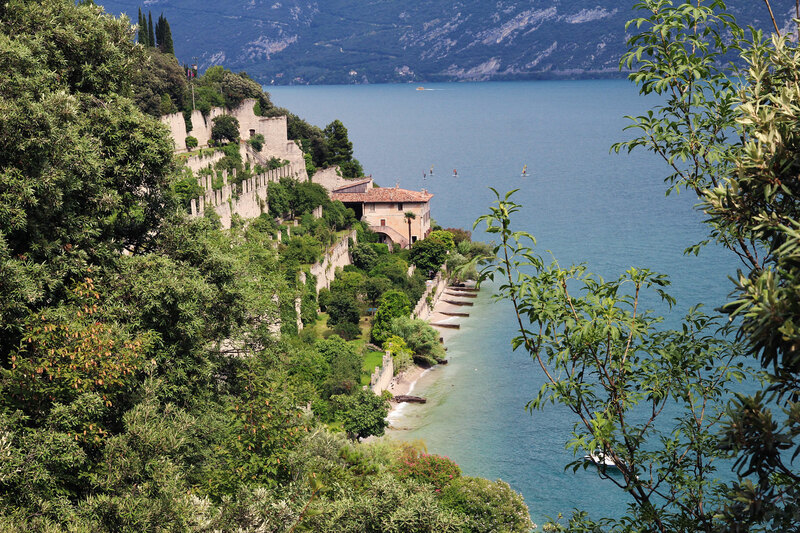 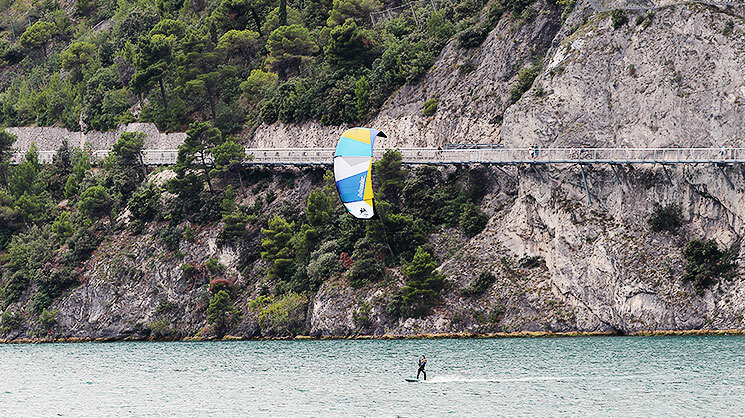 We are pleased to report the story of an engineering experience, which is still part of an overall project – that of slow mobility around Lake Garda – which fully enters the category of interventions aimed at promoting sport as good practice for all, a constant trace in the spirit of our magazine.